Growing up in New York City my brother and I were privileged to know my parents’ wide assortment of wonderful theater friends, some of whom babysat my brother and I (Angus and Rufie), others who drank screwdrivers for breakfast (name withheld for obvious reasons), some who ‘hated children’ so keep-a-low-profile-kids (Fred Tobey) and then there was Marshall. Marshall Goodman was an artist who always lived on the edge. He was bigger than life, flamboyant, a known ladies man, and an elf. Loud, exuberant, he would burst into our house and everything just got more colorful. He struggled, painting fanciful images in Lord & Taylors, doing sketches down at the Courts for newspapers, and annual Christmas cards, usually featuring cats. He adored cats. He once had an ocelot that when it became too big and began to scratch him, he donated to the zoo. Alas, it was attacked by the big cat in the next cage and bled out. He was devastated. After my father died he came to the memorial service. He was back in New York City after a stint in Jersey City (cheaper rent) and I began to visit him periodically in his city apartment. He was a Buddhist at that point–interesting choice but he honored all living things. He would regale me with tales of his time at the RISD in his youth. When he became sick and ended up on the hospital I visited him. When he passed away, I was genuinely sad and met his lovely brother Seymour, who was as rational as Marshall had been the opposite. Seymour had to empty out his flat, full of art, sketches, tons of stuff. At the time I saw a painting that struck me as simply beautiful. 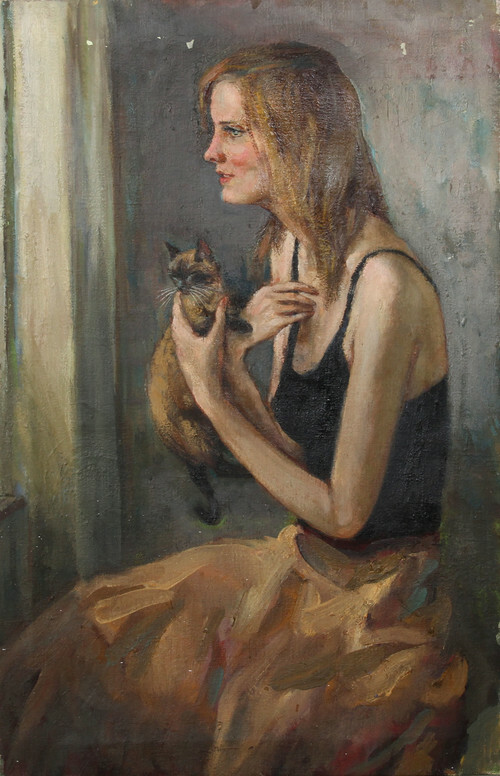 He featured a slim young woman with a Siamese cat. Seymour has arranged with a gallery to buy all of Marshall’s artwork in bulk to sell. I tracked the painting and years later, it seems to still be for sale. But the price is now listed at $15,000! Marshall, the quintessential artist, never had any money at all and I cannot help but regret both that there is no way that I can afford that painting, and that Marshall cannot know how much they are asking for it. I am sure he would be astonished. I hope my father and he are toasting it with cocktails in heaven’s bar.